Outsource2india, a leading software and IT services provider has been providing competent software maintenance and support service packages to global organizations and independent software vendors for over a decade. Software maintenance team at Outsource2india is dedicated in the areas of Version Upgrade, Database & Language Migration, Porting, Re-Engineering and Functionality & Version Upgrades amongst others. So, whether it is a critical application running on a SUN server in New Jersey or an email chat running in Berlin on an HP Server, our on-time maintenance and support services can help you meet your business objectives under all scenarios. Additionally, we can resolve any software related errors and bugs, like rectifying misspelled words or sentences in your software's interface, eliminating bugs & errors, and correcting any wrong algorithms in your software product. 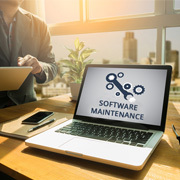 Our preventive software maintenance services aim at planning and incorporating solutions to meet future requirements and overcome problems that may ascend in the long-run. We have set up a highly efficient and reliable product support team at Outsource2india, which caters to customers in any geography 24X7, and keep their critical business systems functional. Our maintenance and support operations include critical planning for supportability, determining logistics, and post-delivery operations, yet are cost-effective and timely. We offer multiple Pricing (Fixed, Variable) and Time (24X7, Weekly, Hourly) options, and can even create a custom package that suits your unique business needs. We offer software support for any Software developed by us and also for the third -party software. We offer two types of software support, Technical and online, and offer affordable SMP renewal options and Yearly/Monthly support packages. Fixing Bugs - This includes troubleshooting software issues, and doing maintenance tasks regularly like managing the source code, Version, patch and releases, Integration of releases, and fixing site crashes at priority, among others. Software support and Maintenance is usually a long-term contract where we understand client's support requirements and train our support engineers accordingly. However, depending on the project type and requirement, it can be tailored to monthly contracts as well. We enable your existing software application or future releases to meet your business requirements and challenges in an effective manner. Outsourcing your organization's maintenance and support services to O2I will ensure that your software has a competitive edge, as we leverage word-class tools and technology-driven platform to address all your business requirements. Your Software needs proper pampering and care like any other entity. Our people understand Software in-and-out, and provide reliable software infrastructure that takes complete responsibility for your maintenance and support requirements. You can try outsourcing with a short-term contract, and move to long-term contracts after getting satisfactory results. Get in touch with our executives now, and transcend your business to greater heights! Why Settle For The Rest, When You Can Have The Best!